This Ralph de Rochford first appears on record in 1350 when he and his brother Sir John de Rochford II of Fenne were appointed with eight others as “assistants” to the influential Boston Guild of Corpus Christi. Their father, Sir Sayer de Rochford, had been a member since 1343 and it must have been under his great influence that the two brothers received these valuable posts. Their co-assistants apparently included the chamberlain of the exchequer John Bokingham, the Lincolnshire heirs Robert de Willoughby of Eresby and Ralph de Cromwell, and – most notably – the king’s son John of Gaunt. This prince would later play a critical role in Ralph de Rochford’s life, but in 1350 he was only ten years old: young age was evidently no barrier to joining the Guild. We get more certain confirmation of Ralph’s age from a property transaction of 1352, in which he, “Ralph de Rocheforde son of Saier de Rocheforde”, granted some land in Norfolk to a man named Thomas de Oxwyk. Ralph must have been of age by this time, and since his father was born around 1294-1295, Ralph was probably born between about 1314 and 1332. Ralph’s mother, therefore, was Sayer’s first wife, Elizabeth, the heiress and probable daughter of Sayer’s close associate Sir Peter de Limesy. Ralph’s brother Sir John was the eldest son; it was he who would inherit the Rochford estates at Fenne and Stoke Rochford in Lincolnshire, and their mother’s family estates at Arley and Bascote in Warwickshire. But Ralph had a remarkably good start in life for a younger son. He was certainly Sayer’s second. Unlike his older brother, Ralph was not yet knighted, but his first royal appointment was early in life, in November 1352 as a commissioner of the walls and ditches in Marshland Hundred. So he already seems to have been living in or near Walpole by this time, when he was probably in his twenties. Then, around 1354-1355, he and his wife Matilda (or Maud – they are the same name) concluded a property transaction that gave them estates in the villages of Walpole, Hindringham, Barsham, Kettlestone, Creake and Guist, all in the north of Norfolk. This is the first mention of Ralph’s wife Matilda and it has the ring of being part of a marriage agreement; the couple had probably married only shortly before. Both Francis Blomefield’s account of the Walpole Rochfords, and Walter Rye’s index of Norfolk fines, refer to this transaction, and both imply that Ralph’s father Sayer and two other men – Robert de Stikenay and Ralph de Bigeney – granted this land to the young couple. However, a reading of the original court manuscript of the transaction, which is in the National Archives, reveals that there was much more to the story. First, the transaction took place “from Easter day in fifteen days, in the years of the reign of Edward king of England the third after the Conquest, twenty-eight” – that is, on 27 April 1354. So Ralph and Matilda were already married by that date. Less than a month later Sir Sayer concluded the sale of his interest in the manor of Budbrooke, Warwickshire, which he had inherited from his father, for £100. One has to wonder whether there was some financial connection between the two deals. Perhaps Sayer used the proceeds from the sale of Budbrooke to finance his son’s marriage to Matilda. Second, the property Ralph and Matilda acquired was “three messuages, one mill, 230 acres of land, 42 acres of meadow, 10 acres of pasture, and 100s of rent, with appurtenances, in Walpole, Hyndryngham, Barsham, Ketelston, Creyk and Gayst”. This was a decent patch but probably not enough to justify Ralph’s later status as a knight and a leading county player. Moreover, later records suggest that the Rochford properties at Walpole, Hindringham, East Barsham and Kettlestone were all considered to be manors, so we would expect more extensive estates to be connected to them. The property in this transaction must have formed just a part of Ralph and Matilda’s overall possessions. Third, the transaction begins by recording that Ralph and Matilda “remised and quitclaimed” the property “from them the said Ralph son of Saier, and Matilda, and the heirs of her the said Matilda, to the said Saier, Robert [de Stikenay] and Ralph de Bigeney”. In return for this, Sayer, Robert and Ralph de Bigeney granted the property back to the newly-weds with certain conditions as to who would inherit it. This was a classic form of property settlement on marriage. It tells us that Matilda was the heiress of all this property and that as part of the marriage deal she was agreeing to how the property would be owned (jointly with her new husband) and passed on after their deaths. The details of the latter are revealing. After Ralph and Matilda died, “the male heirs of their bodies” – that is, their male descendants together – would inherit the property. If they had no such male heirs, then “John son of the same Ralph son of Saier, and the heirs of his body” would inherit it. If that line failed, then “Petronilla, sister of the same John, and the heirs of her body” would inherit it. And then only if that line failed too, the property would revert to the next “right heirs of Matilda” – for example, any sons she had by other fathers, or any daughters she had by Ralph or another father, or her sisters, or her cousins. So we learn that Ralph had already been married, that his earlier wife had died by April 1354, and that he had a son, John, and a daughter, Petronilla, by her. No other records of Ralph’s previous wife have been found, so we do not know who she was. And likewise, no other records of their children John and Petronilla have been found. Matilda, then, was Ralph’s at-least-second wife. It is interesting that she (or her family) agreed that his son and daughter by a previous marriage should come before any daughters they had together, and before her own family, in line to her inheritance. Perhaps Ralph brought a sizable estate or sum of cash of his own to the negotiations, in order to swing a deal like this. John must have been Ralph’s eldest son and heir, but he appears to have died before May 1400 and probably much earlier. A royal writ from that month reveals that Ralph’s heir was another son named Henry, whose children would continue the Walpole Rochford line. If Henry was John and Petronilla’s full brother, then surely his name would have appeared alongside theirs in the 1354 settlement, so Henry’s mother was probably Matilda. The dates bear this out. Henry was of age by 1388 and died around 1435-1442, so he was probably born between about 1355 and 1368 (making him 67 to 87 years old when he died). Matilda and Ralph married by early 1354, as we already know, and she would die in 1369, as we will shortly see. If this is correct – that Matilda was Henry’s mother – then she was the foundress of Walpole Rochfords. The 27 April 1354 settlement of her property does not say anything about who her family was; nor do any other records that I have found. The settlement does relay that she held her property of the chief lords, but it does not specify which chief lords. From this information and the surviving records of property ownership at Walpole, Hindringham, East Barsham and Kettlestone, our best guess is that she was a Walpole, a Godard or a Denver. Blomefield’s Norfolk relates that she was a “daughter and coheir of Sir James Walpole”, which could fit with the known facts. However, I have found no primary evidence to support this, or even that such a person ever existed. Blomefield also relates that there was another transaction on “Thursday after the feast of St. Winwaloy”, which was 1 May in 1354, just a few days after the last transaction. Apparently Ralph and Matilda granted to Ralph’s father “a messuage with a windmill in Walpol, with all his lands and tenements in Walpol, Walsoken, Enemeth, and messuages in Hindringham”. This must have formed another part of the couple’s marriage agreement and presumably the original documents would, if known, reveal all sorts of interesting detail. Sayer did not have much to do with Walsoken, Emneth or Hindringham himself, so he probably immediately re-granted the property back to the couple with certain conditions, just as he had done with Matilda’s inheritance a few days earlier. Then around 1367-1368, according to Blomefield, the couple granted property in East Barsham to “Robert Lacock of Walsingham, clerk, &c”. Again, I have not found any original record of this transaction, but there is no reason to doubt it. It looks like the setting up of a trust whereby the clerk Lacock and his colleagues would act as trustees or feoffees to uses of the property, holding it in interests of Ralph and Matilda or the couple’s chosen beneficiary – one of their children perhaps. Indeed, Ralph was about to join John of Gaunt’s forces for a tough campaign in France, which, like many of this era, would be ridden with plague and dysentery. He had good reason to consider his family’s needs should he fail to return. 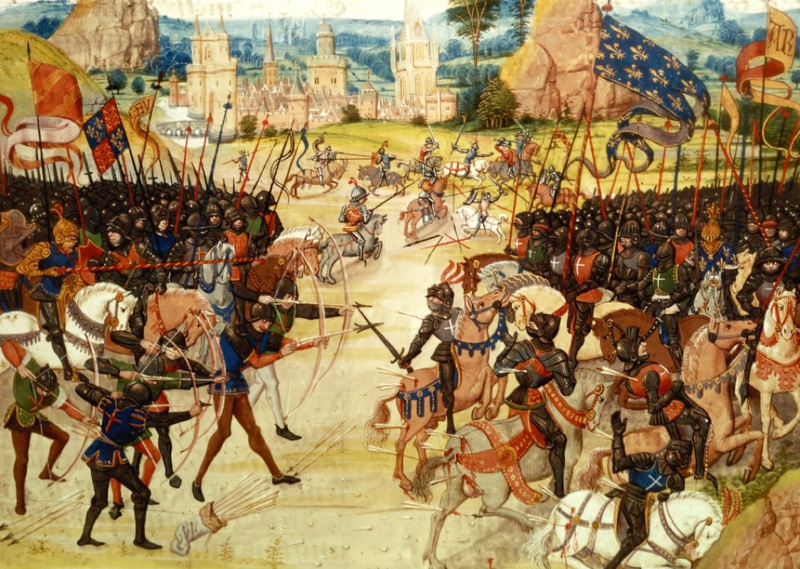 The battle of Poitiers, 1356, with the forces of the Black Prince on the left, and King John of France on the right. Sir Ralph de Rochford I of Walpole was at the battle and his father, Sir Sayer, was later appointed to guard the captured French king at Somerton Castle in England. From Froissart’s Chronicles (BNF Fr 2643, f. 207). Returning to Ralph’s professional life: like his father, he served on many royal commissions of the walls and ditches throughout his life, both in Marshland Hundred and in neighbouring parts of Cambridgeshire. Between 1352 and 1391 he served on a total of ten. For three of these, in 1355, 1363 and 1368, he and his father served together. For two, in 1377 and 1378, Ralph’s brother John de Rochford the Younger of Boston joined him. From 1365, when he was in his thirties or forties, Ralph would also receive other local royal commissions, but until then his real focus was elsewhere. In March 1356 he was in English-owned Aquitaine when King Edward III sent him a letter of royal protection. He was to join Sir Reginald Cobham and others in the company of the king’s eldest son, Edward the Black Prince, for an invasion of France. They set out from Aquitaine in August with a force of some six thousand men, raiding their way north to meet the forces of King John II of France at Poitiers. There, on 19 September, they fought and outmanoeuvred the French, surrounded their king and his fourteen-year-old son, and captured them along with several thousand other men. The rest of the French army fell apart and fled. It was one of the great English victories of the Hundred Years’ War. In March the next year the Black Prince returned to England a great hero with his royal prisonsers in tow. Ralph’s own father, Sir Sayer, was one of the five knights King Edward appointed to keep safe the most valuable prisoner of all, King John of France, “at their peril” at Somerton Castle in Lincolnshire. It was probably during this campaign that Ralph was finally knighted. On 24 August 1358 he received royal protection again, and on this occasion he was explicitly called a knight for the first time. There were no major English campaigns in France in that year; King Edward’s focus was on securing the best possible terms for releasing the French king. So it is not clear what Ralph’s movements were that summer, but he was probably back in Norfolk by November when the royal council appointed him and his father to another commission of the walls and ditches in Marshland Hundred. From 1365 Ralph’s range of royal commissions expanded. 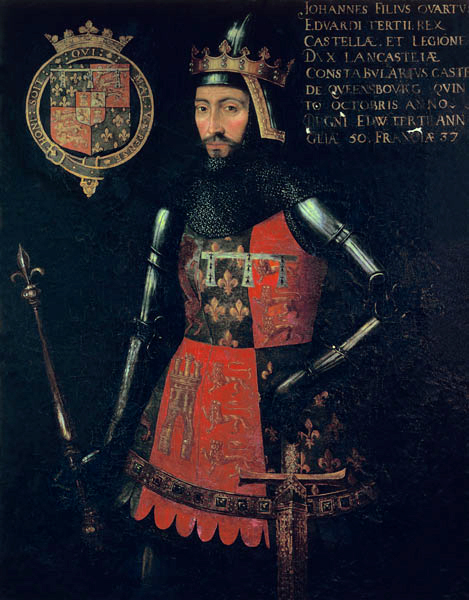 In July that year he became a justice of the peace in Norfolk, and in October 1366 the king and council appointed him as a commissioner of array for the Parts of Kesteven in Lincolnshire, while his older brother Sir John was preparing to join John of Gaunt’s upcoming expedition to Castile. By 1369 Ralph, too, would be preparing for war again. The Rochfords’ late 1300s patron, John of Gaunt, by an unknown artist. In May 1360 the English and the French had concluded the Treaty of Bretigny: the French were to cede a huge chunk of France and pay a crippling ransom of three million gold crowns in instalments; in return, the English sent the French king home. But the French king died in 1364 and in 1369 his son, Charles V of France, tore up the treaty and confiscated Aquitaine and other English possessions in France. The English declared war. In July that year Ralph and his brother Sir John joined John of Gaunt on a punitive expedition into the north of France. They pillaged Normandy and marched on Harfleur, but dysentery and plague set in among their forces, and they returned to England in autumn having achieved little. Back at home in November, the royal council appointed Ralph as a justice of the peace for Norfolk once more. This foray into France appears to have been Ralph’s first formal engagement with John of Gaunt, who was now both earl of Richmond and duke of Lancaster – titles that the Rochfords had been close to and loyal to for generations. Over the coming years this relationship would have an enormous impact on Ralph’s and his heirs’ lives, as well as those of their Lincolnshire Rochford cousins. Before the century was out, they would have a hand in elevating Gaunt’s own son to the throne. It was around this time that Ralph’s father died, and it may be that Ralph inherited or acquired some property in Lincolnshire, since he became more involved in that county’s matters from the 1370s. In 1371 he was party to a settlement of Hippetoft Hall and property in Freiston and Toft, and in a remarkable charter of 1373 he manumitted or made free a serf, “Thomas the son of Alexander Benrige dwelling in Benington with all his posterity begotten and to be begotten … that neither I, the aforesaid Ralph, nor my heirs, nor anyone … in our name, shall henceforward be able to demand or sell any claim of the right of servile tenure upon the aforesaid Thomas and his posterity in any manner whatever.” It was a grand gesture, and is today a useful reminder that serfdom was still present – and indeed commonplace – in late 1300s England. Ralph joined his older brother on two further campaigns under John of Gaunt. In August 1373 they set out from Calais with their captain Sir Robert de Willoughby in an army of some ten thousand men for a great raid through French territories, finally reaching Bordeaux in December. Their intention was to relieve Aquitaine, but their forces were severely depleted and in April the next year Gaunt sailed home. The Rochford brothers were back in England by July 1374 when they witnessed a charter together for Andrew de Leake regarding property at Leake and Leverton, both near Fenne. In summer 1378 Ralph and his brother joined Gaunt’s last campaign in France, the siege of St Malo. Their forces were limited and the enterprise was a failure. They returned to England in autumn that year. King Edward III had died in 1377. Edward’s son and heir, the Black Prince, had died before him, in 1376, and so the prince’s own eldest son was now king, in name at least: Richard II. But Richard was still only ten years old, and so Gaunt, who was his uncle, was de facto ruler of the realm. Under Gaunt’s patronage the Rochford brothers’ careers bloomed. In early 1379 Sir Ralph and Sir John Auncell were elected as knights of the shire to represent Lincolnshire at the Westminster parliament at Easter – a role to which Ralph’s older brother had been elected only two years before. Ralph also served on two ad-hoc Lincolnshire commissions in that year. One, in August 1379, was to investigate suspected corruption in the collection of taxes in the Parts of Lindsey, Kesteven and Holland. The other, for which his younger brother John the Younger joined him, was to deal with “the persons who by night scaled with ladders the walls of the house of Friars Preachers in Boston … broke their doors and windows” and assaulted the prior and his friars in their beds. But parliament seems to have determined that the victims deserved it, as in February the next year it cancelled the commission and instructed Ralph and his colleagues to free anyone they had imprisoned because of it. Ralph’s year at the forefront of county politics did not persist – it would be seven years before he received another royal commission. But he continued to be involved in local property transactions, mainly in Lincolnshire. In 1381 he acquired (or became a trustee for) some property in Hagworthingham that had belonged to John del Chaumbre of Walpole and Sarah his wife, with the help of his brother John the Younger. In 1382 Ralph was involved with Robert de Leake in property deals at Leake and Leverton, in 1383 with Thomas Claymond at Pettistree in Suffolk, and in 1385 with Robert de Cumpton at Ashby by Partney near Hagworthingham. By this time French plans for a major invasion of England were well underway. The panicked English administration summoned men from all over the country to London to form a defence force. Traders in Lincolnshire and elsewhere sniffed an opportunity to make a quick buck, hiking their prices as local men-at-arms and archers kitted themselves out for war. The royal council was not impressed, and in September 1386 it sent instructions to Ralph, his brother Sir John and others to proclaim throughout Lincolnshire that “armourers and vendors of arms, armour and horses” were not to sell their wares “at a dearer rate than their reasonable value heretofore, under pain of forfeiture”. By a stroke of good luck for the English, bad weather on the channel and a series of mishaps prevented the French fleet from mounting its invasion. But Richard II’s reign was descending into crisis. While Gaunt was in Castile trying to secure the throne there for himself, the young English king, now nineteen years old, fell out with parliament and his nobles turned against each other. In early 1388 a group of five calling themselves the Lords Appellant seized control of government and set about purging its power structures of the king’s favourites in a ruthless bloodbath of executions. Sir Ralph de Rochford, his son Henry, and brothers Sir John de Rochford and John de Rochford the Younger all appear on a parliamentary list of Lincolnshire knights and gentry who swore allegiance to the Appellants, dated 20 March that year. It is worth noting that Ralph’s older son by his first marriage, John, was not among them. John would not have been much older than 36 years, but he had probably already died. Civil war was brewing, but Ralph was at least 56 years old and nearing the final years of his life. He returned his focus to his Norfolk home. In May 1388 he served on one more ad-hoc commission with John the Younger, to investigate a quarrel over the manor of Denver in Norfolk. And on 3 July 1391 he served on his final commission of the walls and ditches around Marshland Hundred. Walpole St Peter’s in Norfolk, rebuilt in the 1300s. The Rochfords of Walpole were probably major benefactors to the project. They had a chapel and burial place at the east end of the north aisle, beside the windows on the left side of this photo. There were once tombs, effigies and stained glass coats of arms for members of the family here. Photo by Gary Troughton, Flickr (CC-BY-NC-2.0). This is the last record of Ralph alive. It appears that the king had intended to appoint him and his brother John the Younger to another commission of the walls and ditches, but for some reason “that commission came not to the hands of the said Ralph [and] John”. It was also not logged in the Patent Rolls in the usual way. Left untended, by 1400 the “walls, dikes, gutters, sewers, bridges, causeways and weirs upon the shore of the sea and marsh” in the Marshland area “were, by ebb and flow of the sea, and by flooding and leats of fresh water flowing down through divers places, so burst and broken, that in times past great damage happened for lack of repair”. The treasurer and the barons of the exchequer began proceedings against Ralph’s executors as well as John the Younger and Thomas de Welle. But at length, in May 1400, one Thomas Merton swore in chancery that Ralph had never received his commission and the proceedings were closed. So Sir Ralph de Rochford had died some time between July 1391 and May 1400, around the same time as his older brother Sir John. John the Younger, meanwhile, would live on until December 1410. Ralph must have been around sixty to eighty years old when he died. He was buried in Walpole St Peter’s church beside his wife, Matilda, who had died many years earlier in 1369 – a Black Death year – when she was probably only thirty or forty years old. A sea flood had destroyed most of the original Walpole St Peter’s church in the year 1337. Then, in 1348 and 1349, the Black Death swept across England for the first time, decimating the population and destroying communities. It delayed the rebuilding of Walpole St Peter’s so the new nave and aisles were not completed until the late 1300s, during Ralph’s time. He was probably one of the major benefactors to the project, and he may even have funded the whole of the north aisle. 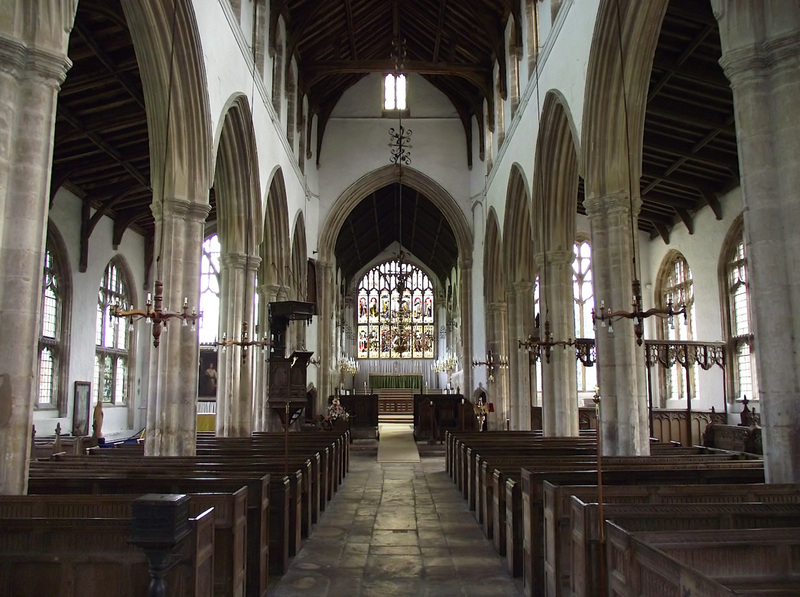 When Francis Blomefield wrote about it in the 1700s, the stained glass windows of this aisle and the north side of the nave were full of arms and portraits of Ralph’s family, while the east end of the aisle was “taken in by a screen, and was the chapel and burial-place of the Rochfords”. In it was a large brass altar monument to Sir Ralph and Matilda. Effigies of Sir Ralph de Rochford I of Walpole and his wife Matilda in the Rochfords’ chapel at Walpole St Peter’s. No trace of this monument survives today. From Richard Gough’s Sepulchral Monuments, 1796. The chapel is still there, but neither the stained glass nor the monument survive today. Fortunately, in 1796 Richard Gough printed an engraving of the monument in his Sepulchral Monuments of Great Britain. In it, Sir Ralph is kitted out as a knight in a full suit of plate armour, a dagger on one belt and a sword on another, flowing curly hair around his shoulders and a long, curly beard. He is standing on a lion. Beside him, Matilda wears a flowing robe with a cape, a jewelled girdle around her waist, a reticulated head-dress and veil, and two very long necklaces of beads, one with a large, jewelled pendant. At her feet are two small dogs with decorative collars. Above Sir Ralph’s figure there are two shields with the arms of the Rochfords – Quarterly or and gules, a border sable bezanty – and what appears to be a fleur-de-lis in the first quarter of each. This is interesting. There are no other records of Ralph bearing a fleur-de-lis on his arms, whereas he often seems to have borne a silver annulet, a type of ring, in the second quarter. For example, there is a roll of arms dating from around the time of Ralph’s death, now known as Willement’s Roll, in which Ralph’s arms and his older brother Sir John’s appear side by side. Here Ralph’s arms have the silver annulet, whereas John’s have no differencing marks, he being the eldest brother. There are other cases where the Rochfords’ arms had a fleur-de-lis in the first quarter – for example in the east windows of the churches of Stoke Rochford and Lincoln St Mark’s, where they were impaled with the Hillary arms. These reflect the marriage of Sir Ralph’s and Sir John’s father, Sir Sayer de Rochford of Fenne, and step-mother Joan Hillary. Judging by Gough’s engraving, Ralph and Matilda’s monument was an extraordinary, wonderful piece, both detailed and highly decorative in design. It must have been commissioned by their heir, Henry, and it must have cost him a small fortune. It is a world apart from the often rather dry public records and legal documents that tell us the bare facts of Ralph and Matilda’s lives. Their monument was a personal, self-conscious and intimate piece that reveals much about how the family saw themselves – or, at least, how Henry wanted the world to see them: his father as a grizzled, long-locked warrior-knight in the finest armour; his mother as a beautiful, bejewelled lady in soft, flowing robes. Shortly before Sir Ralph de Rochford of Walpole died, another Ralph Rochford begins to appear on record – for example from 1390 in the financial accounts of the future King Henry IV’s expeditions to the Holy Land and Prussia, and then in August 1394 as a surety for Hugh Shirley. Some accounts have confused these two Ralphs for being the same person, but the latter Ralph was a much younger man and was not yet a knight; he was serving as an esquire in 1390. This was Ralph Rochford III of Fenne, the eldest son of Ralph of Walpole’s elder brother Sir John, and heir to the ancestral Rochford estates at Fenne and Stoke Rochford, and the Limesy estates at Arley and Bascote. Ralph of Walpole’s heir, meanwhile, was his own eldest surviving son, Henry Rochford, whose biography follows.